Hi AMW Friends! I haven't blogged about brow products (especially powders) for quite some time because I am very much contented with my Benefit's Brows A-Go-Go palette (discontinued but you can still get Brow Zings) But when I received Kiss Me Heavy Rotation Powder Eyebrow and Nose Powder from Mandom Corporation as Holiday gift last year, I knew I had to give Benefit a rest and try this one! So far, I received compliments after using this palette! 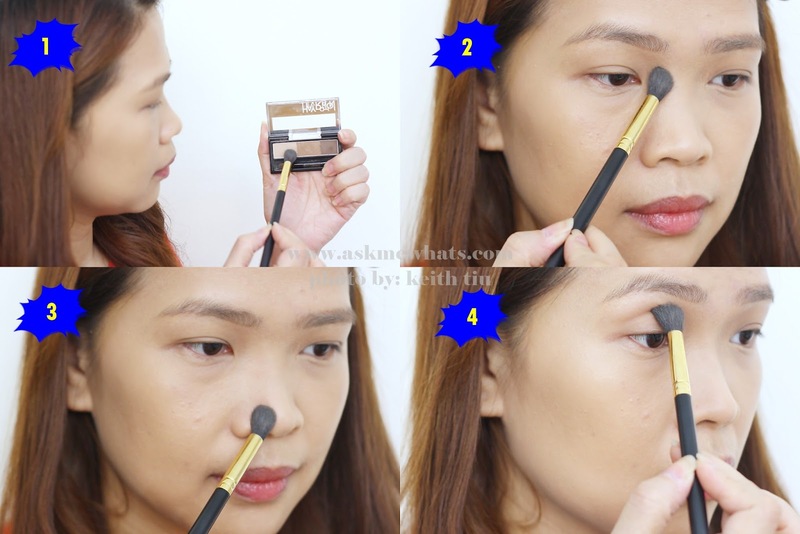 Want to know more about this inexpensive brow powder that doubles as a nose contouring powder? What I like about the Heavy Rotation is you get 3 shades to choose from or better yet, 3 shades to mix and match! All 3 shades are useful. Can double up as brow powder or eyeshadow. Applied on brows --- long lasting. If used as nose contouring powder, it isn't as long lasting. The dual brush that comes with the product is a bit too short to handle. A very nice start-up eyebrow and nose contouring powder. Even for professionals, this brow powder duo can create subtle and dramatic brows! Read the tips from Heavy Rotation at the back of the packaging! #LOL #JustJoking But do that too! If you have round face, create a more angled arch. Use the darkest shade to fill in "blank" spaces of your brows. Feel free to mix with middle shade if you find the shade too dark. Use the lightest shade as nose contour if you have fair skin. Use the middle shade as nose contour if you have medium to dark skintone. The first 2 shades are wonderful to deepen your crease. To keep yourself from creating a very "strong" look, use the first 2 lighter shades when you apply on the inner corner of your brows. Mimic the look of hair by creating short check marks. Brow powder users! 02 Natural Brown would work on fair to dark skin tone. Available at Selected Watsons priced at Php595.00 (approx $13.50). Same as most Japanese products, it has a carton. Swatch at the back of my hand. If you are fair like me, the lightest shade can actually double up as a "highlighting powder". Kiss Me Heavy Rotation used as crease and nose contour powder. Mix first 2 shades. You can opt to just pick the 2nd shade if you have medium skintone. 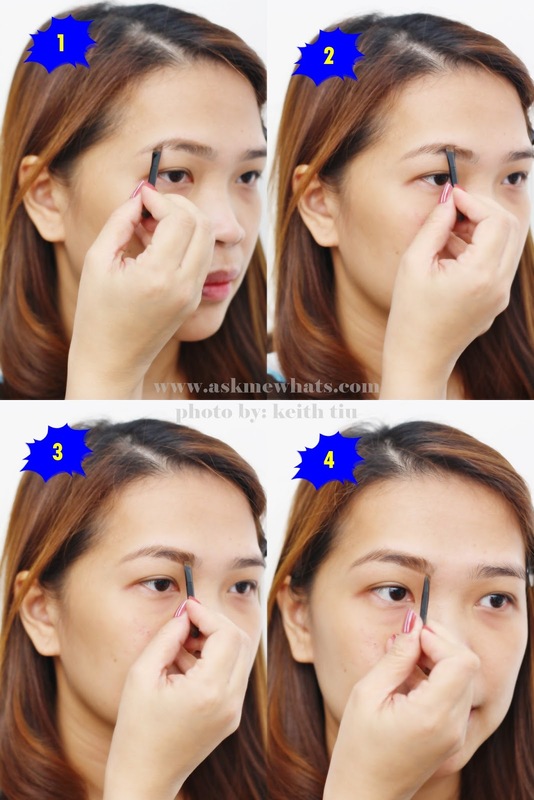 Apply starting from the inner "triangle" (just below the start of the brows) going straight down to your nose. Blend as you go on. Try to keep it straight as possible. Feel free to use the same shade as a "crease" powder. This will create a deeper set of eyes. Bare face with nose contour and crease powder. Now for the sake of review, I used the free brush that comes with the product. On normal days, I prefer to use my own angled brow brush. Keep in mind: Apply lighter shades at the start of your brows. 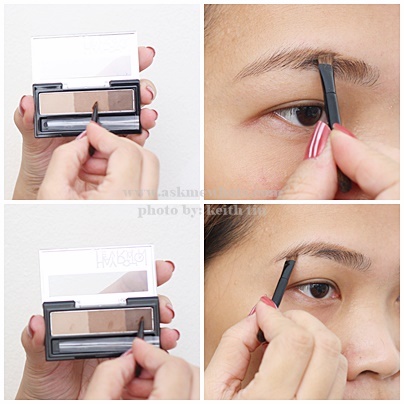 The darker brow powder will always be used to fill in "sparse" areas and at the tail of your brows. Mixing the first 2 lighter shades, define your brows and if needed, deepen your arch. Use the darkest shade to fill in sparse areas. Keep in mind to do a short 'check marks'. Use the middle powder to fill in the rest of the brows. Use the lightest shade to fake more brow hairs. This time, flip the brush and draw using the same direction as the growth of your brow hairs. Tip: If you have extremely dark brows, feel free to follow with a brow mascara. What is your favorite brow powder?Do you double your brow powder as eyeshadow and contour powder as well? After Benefit, this is turning out to be my favorite, inexpensive brow powder! And I am finding myself using this a lot as eyeshadow too! I also like to use the first 2 shades to contour my nose but for the rest of my face, I still go for Happy Skin Feeling Sculptacular Face Contour kit. thanks for this review and i was surprised that it costs less than 595php way cheaper than my favorite kpalette lasting 2way eyebrow! Tried maybelline powder eyebrow kit before and as of now im trying the eyebrow pencil. I haven't tried the maybelline one! Can't wait to try it too!